Martin Hunter wins Gold at the 2015 International Bowls for the Disabled World Championships in New Zealand. Martin won the B7 Singles Gold Medal at the 2015 International Bowls for the Disabled World Championships at Hutt City Bowling Club in Auckland, New Zealand. He beat Barry Charity (Australia) in the final 21-16. 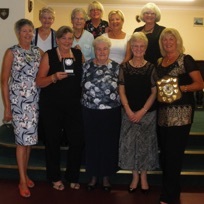 Great Success for Burntisland Ladies and a first for the Club! The Ladies won the 2015 Kirkcaldy Ladies League title. A tribute to the skill and enthusiasm of the Club's Ladies.